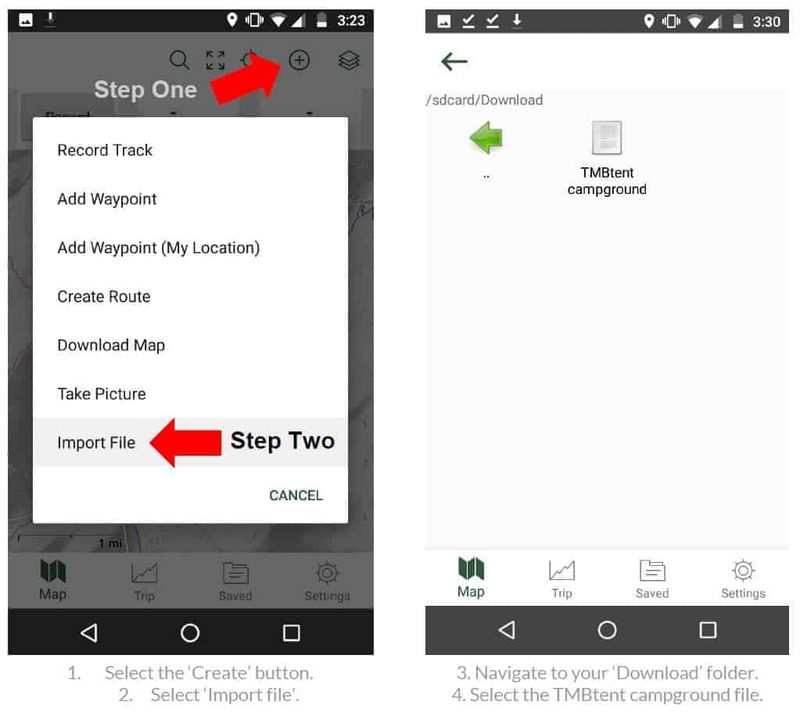 If you’re using our Guide to Camping on the TMB in conjunction with our post on how to navigate the trek, we thought it would be helpful to provide a resource for finding your campground when using the Gaia GPS app on your smartphone. The following post will show you how to download customized location data for all of the campgrounds mentioned in the camping guide and how to use it with our guide to navigating the TMB. Let’s get started. If you’ve already downloaded the Gaia GPS app to help you find your way on the TMB, the steps below should be fairly intuitive. If not, be sure to check out the links above to get started with this awesome app. Get our Complete Guide to Camping on the Tour du Mont Blanc for only $4.99 USD! All payments are securely processed via PayPal and your guide will be sent directly to your inbox. Save yourself the trouble of searching all over the internet and get access to everything you need to plan your TMB adventure in an easy to read guide. All for only $4.99! Included in the Guide is a link to a Dropbox.com file and you’ll select ‘Download’, then ‘Direct Download’. Note: This is much easier if you download the file directly to your phone. This will save you the step of having to email yourself the file in order to have it saved on your phone. First, you’ll open the Gaia GPS app and select the ‘Create’ button in the top right corner. From here you’ll select ‘Import file’. 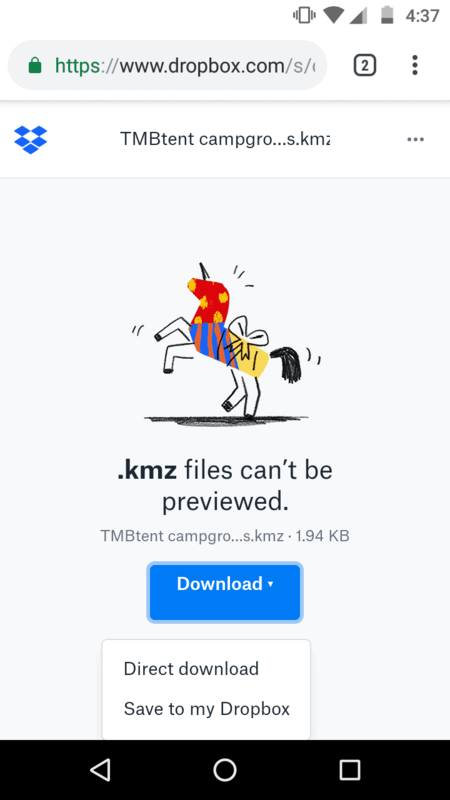 Next you’ll need to navigate to your ‘Downloads’ folder, or whichever location you saved the .kmz file to. This was a bit tricky to locate for me, but I was able to find it in the ‘sdcard’ folder. From here, Gaia GPS will recognize any files that are compatible, including the Tour du Mont Blanc Campground locations file. Select the file and the Gaia GPS app will import the location data. Give your phone a moment to import the data and voila! You should now have all of the campgrounds that are included in our Guide to Camping on the Tour du Mont Blanc saved on your phone! Now when you’re out on the trail you’ll easily be able to see exactly how far you have to go until your next stop, and easily be able to find your campground at the end of the day. The instructions above give you a step-by-step guide for importing the Tour du Mont Blanc campground location data into Gaia GPS on Android. We happen to both use (and love) Android phones, but know that many readers will have iPhones and want to know how to import the file to their phones. Rest easy because the process is even easier on iOS! The best way is to select the ‘Direct download’ option (shown in Step One) when you click on the Dropbox file download link. After the download is complete you should be prompted with a button that says ‘Open in Gaia GPS’. Simply select this and the file will automatically import into your Gaia GPS app! Be sure to let us know in the comments if you were able to download the campground data and if you found it useful on your trip! If you’re looking for one-on-one support in preparing for the Tour du Mont Blanc, we can help! Learn more about our personalized TMB coaching services. Tour du Mont Blanc Packing List – Be sure you’ve got everything you need! Tour du Mont Blanc Logistics – Don’t forget the small details! How to Navigate on the TMB – Turn your smartphone into a GPS! TMB Trip Report – Know what to expect! How to train for the TMB – Avoid being the last person to the campground! Guide to Camping on the Tour du Mont Blanc – The essential resource! Tour du Mont Blanc Photo Galley – Find some inspiration! Tour du Mont Blanc Shop – Pick up a souvenir, art print, or T-shirt! How to hike the TMB for (nearly) free – save BIG on your TMB costs! Great – glad it worked! Thank you for your guide and website ! I couldn’t find any other good source for camping on the TMB, even in French ! Just one question regarding food, did you find good dinner supplies in the small food stores on the way ? Things like ramen, rice pouches or lightweight heatable food to have a warm meal when camping. So glad to hear that you’ve found our site useful! Most of the small food stores we encountered had at least a few options of food for campers. In the bigger towns you’ll likely have many more options and better prices, so it may make sense to stock up on lightweight meals there.